Looking for the best electric toothbrush of 2018, but need some help? Read more about the functions your new electric toothbrush should have, and we present our top 3- quality doesn’t have to be expensive. Looking for a new electric toothbrush can be a hassle. There are multiple brands that all claim to be the best, and the prices for the different electric toothbrushes vary quite a bit. 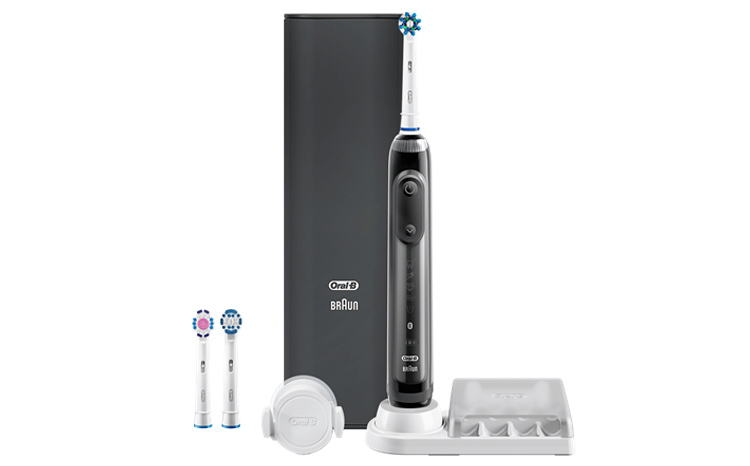 The top models electric toothbrushes to date have state of the art brush head technology, Bluetooth connection, and are beautifully designed. But do you need all of this? Which technology should your new electric toothbrush have? We have come a long way since the manual toothbrush that was driven by hand. The electric toothbrushes that are on the market to date are already a great improvement compared to manual brushing. However, there are two things your new electric toothbrush should have. Timer: Most new electric toothbrushes have a built-in timer that signals when to change sides and when the brushing session has been completed. Nothing fancy, but when you choose a toothbrush, make sure to buy one that has a timer built in. Pressure sensor: Brushing too hard can damage your teeth and gums. Since electric toothbrushes rotate or pulsate really fast, the damage inflicted by hard brushing not only occurs faster but is also more server compared to manually brushing. Having a pressure sensor on your new electric toothbrush is definitely worth the money. And as we show in this article, it doesn’t have to be expensive. What is our best pick? Here is our lowdown for the best electric toothbrushes of 2018. Our number 3 is the Philips DiamondClean Smart series. This sonic toothbrush from Philips has by far the most beautiful design of all electric toothbrushes currently on the market as far as we are concerned. It comes in the colors white, black, pink, silver, and the exclusive lunar blue, and all have that beautiful silky look. All other components that are shipped with the DiamondClean are also well designed. Most notably the charging unit, which comes in the shape of a drinking glass. Useful and beautiful. 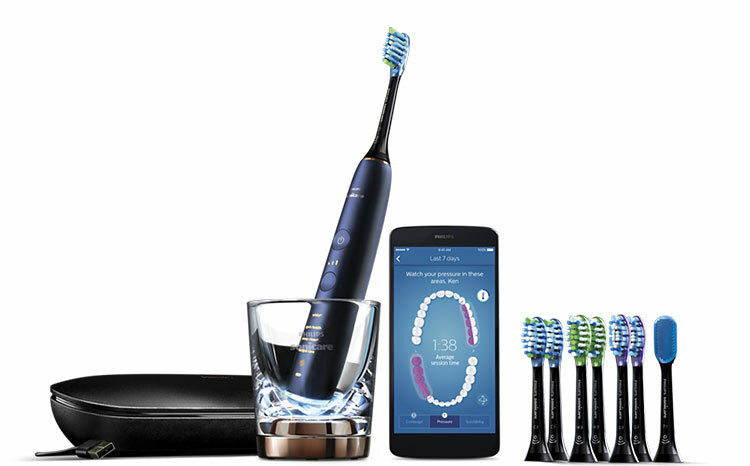 The smart series comes with Bluetooth technology via which you can connect the toothbrush to an app on your smartphone. With the app, you get real-time feedback allowing for a perfect brushing session every time. The DiamondClean has 4 different cleaning modes and 3 intensity modes, depending on the type. These different modes provide the optimal settings for each specific task, being gum massage, brushing, whitening or polishing. You can review all of the functions of the DiamondClean on the website of Philips. The only downside is that the DiamondClean is quite expensive. Then again, if you have the money this electric toothbrush will be worth your investment. The Oral-B Genius Pro 8000 doesn’t have the same beautiful design as the Philips DiamondClean, but has a more industrial look. That doesn’t come as a surprise since this electric toothbrush is a technological powerhouse. Using Bluetooth the toothbrush is connected to an app on your smartphone, allowing you to get real-time feedback while brushing. The advanced position detection technology allows you to actually see how and where you are brushing and ensures you don’t miss a certain area. Perfect brushing every time. The SmartRing can be customized to visualize the feedback you get from the toothbrush, which can be very useful. One thing Oral-B really stands out in is the actual rotary brush head, which is really the best on the market. Just like the DiamondClean, the only downside is the price. The Oral-B Pro 1000 is not the fanciest electric toothbrush on the market to date, but it has all the essential components to put it at the top of the electric toothbrush market. All of this at a fraction of the cost of the absolute top models. One of the most important things on an electric toothbrush is the pressure sensor. Brushing your teeth too harsh by pressing the brush head too hard against the tooth surface can damage your teeth and gums. The Oral-B Pro 1000 stops or slows down as soon as you press the brush head too hard against your teeth. This way preventing damage from occurring. The Oral-B Pro 1000 has a built-in timer, which signals every 30 seconds to switch sides. At the end of the 2 minutes the brushing session it pulsates a number of times to signal the end of the session, so it is easy to know when you are done brushing. The Oral-B Pro 1000 might not be the fanciest looking electric toothbrush you have seen, but it can take care of your teeth like all of the top models. And all of that at the fraction of the costs. 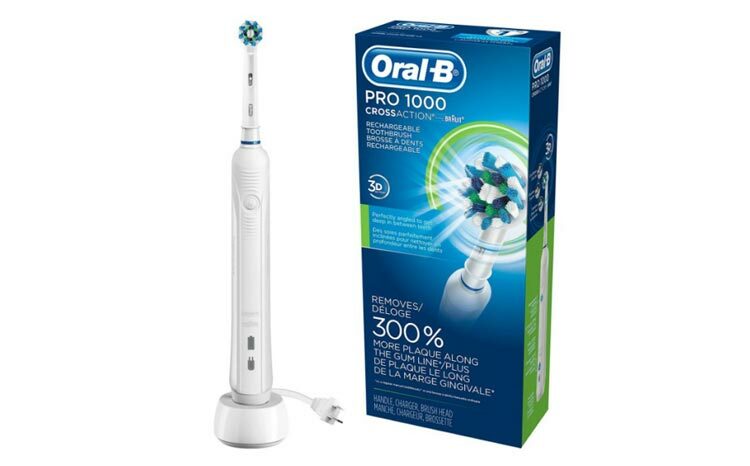 If you don’t have a money tree growing in your garden or feel the need to have the most futuristic-looking electric toothbrush, but you do want the best care for your teeth, the Oral-B Pro 1000 is the model to go for.